In 2014, Artesia renewed its series with once-traditional opponent Alamogordo for the first time since 1989, and the matchup quickly reestablished itself as the solid inter-classification bout it was in the 1970s and ‘80s. The ‘Dogs edged the Tigers by a score two years ago in Alamo, 48-41, then handed the boys in black and gold their first loss in 2015, 34-30, at Bulldog Bowl with current junior quarterback Taylor Null making his second varsity start as a sophomore. Needless to say, the Bulldogs weren’t stunned Oct. 7 in Otero County when Alamogordo darted out to a 12-0 lead in the first quarter. They expected nothing less than a challenge; they simply reevaluated, regrouped, and came away with a 48-35 victory. But with the Tigers having dropped from Class 6A to 5A this season, there’s a little more on the line now than just a mark in the W column. And this week, that prize is a trip to the Class 5A state semifinal round. “They gave us a competitive game the last time, and I think that tells you a lot about the state of New Mexico football,” head coach Rex Henderson said today, “that they’re the eight seed and they played us within a couple of touchdowns. The Tigers took their early lead Oct. 7 on a seven-yard run by senior QB Kyle Hooper and a three-yard pass from Hooper to slot Jalen Bateman following an interception deep in the Bulldog red zone. The ‘Dogs were able to get on the board before quarter’s end, however, on a three-yard run by Robert Fernandez, then went up 14-12 to start the second on a five-yard pass from Null to Kameron Aguilar. A Brett Money field goal and a 79-yard catch-and-run from Hooper to Bateman put Alamo back up midway through the period, but Artesia secured a 27-21 lead at the half on two more TD runs by Fernandez, then expanded it to start the second half on a third. Alamogordo kept it a one-score game to start the final 12 minutes, but a seven-yard run by Null and nine-yard scamper by Isaiah Weideman put the Bulldogs on top for good, 48-28. The Tigers rounded out the final with 2:35 remaining in the game. Of note in the contest was the fact the ‘Dogs outrushed their passing game 336-108, successfully adjusting to what the Alamo defense allowed. The Tigers were a bit more balanced with 175 ground yards and 211 passing, and will likely be more balanced still Saturday due to the loss of speedy back Alex Ramirez. “They’ve lost probably their best player since the last time we played them, but I think in a lot of ways it maybe made them a more complete team,” Henderson said. “They’ve got a whole lot more people involved on their offense, and they’ve been able to do some things they weren’t doing before, so they’re probably a little more balanced offensively than they were in the previous game. 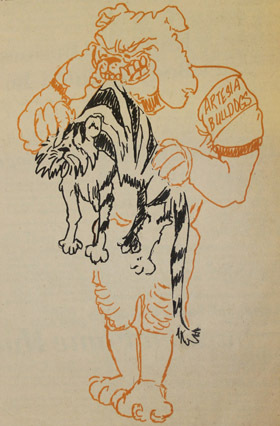 As for the Bulldogs, they’ll be looking to again adjust offensively around what works best against the Tigers, while the defense will need to be ready to contain Hooper – who posted 132 passing yards against Artesia in the teams’ first meeting, 289 last week in Alamo’s 45-14 win over No. 9 Del Norte – running back Dee Smith – 19-100 rushing vs. Artesia, 16-130 against Del Norte – and a range of backs led by David Johnson and Chamar Norman. And as the Friday night lights transition to Saturday afternoon sunshine, the ‘Dogs will also be looking to capitalize on their significant playoff experience and the atmosphere at Bulldog Bowl as they look to move on to the final four. “We had a really good two weeks of practice,” said Henderson. “Our kids have a lot of respect for Alamogordo and knowing that’s who they were playing has, I think, really kind of helped the intensity of our workouts.